It’s £16.00 for a pack of film – close to the old price for SX70 – well, at least in the UK – but there’s only eight in the pack and shipping is £14.00 (it’s only coming from Europe, guys, I can wait a couple of days) – this new stuff is far from cheap – but it’s a startup, their aims are admirable and I’m willing to help the cause, so I pressed the buy button. A few days later the package arrived. Like the web site – and like practically everything else the Impossible Project has designed – the packaging is an elegant concoction of good taste, style, modernity and elegance (with a hint of pretension, but I’ll forgive that) – it looks and feels something special. Seeing the bold “Ilford” typography on the pack only heightened the sense of anticipation and nostalgia. Unless you happened to be Ansel Adams, Polaroid photography always was something of a lottery, but that was part of the fun. You’d see a picture, snap it, but the results were rarely what you anticipated. However the variations you’d get were at least explainable and sometimes you’d mess around with settings just to see how far you could push it. But at least the results were usually acceptable. Unfortunately, with this first pack of PX-100 in a previously Polaroid SX70 Sonar Focus, the results were unpredictable, not easily accounted for and not what I was expecting. Despite trying every possible setting with the camera (there aren’t many), the outcomes were completely random (- except for a dark line about 12mm from the top of every picture). Nothing I did seemed to improve the images, apart form the direction I pointed the camera in, everything was out of my control. Even at the darkest setting the pictures were too light, scattered spots and splotches were present on most of the images – never in the same place, random bits of orange appear in certain tones and there was almost no-contrast – even in strongish sun. I’ve checked the camera over and there are no obvious problems with mirror, lens, or rollers. Each photo was immediately removed from the camera and placed in an inside shirt pocket to keep up the temperature and shield from light – air temp was around 16-17ºC – and left for at least five minutes. As per the instructions. I’ll check the web for any mention of batch problems, but it really seems to me the problem’s with the pack construction. 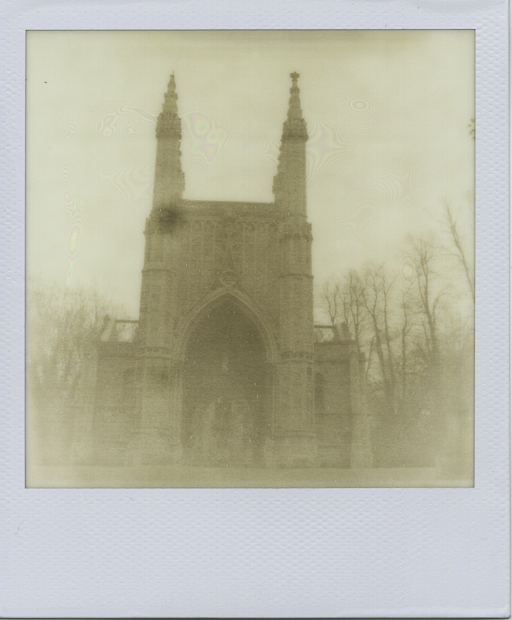 I’ll also run the next pack through another SX-70 and see what happens there (on a warmer day!). It’s not all bad news. 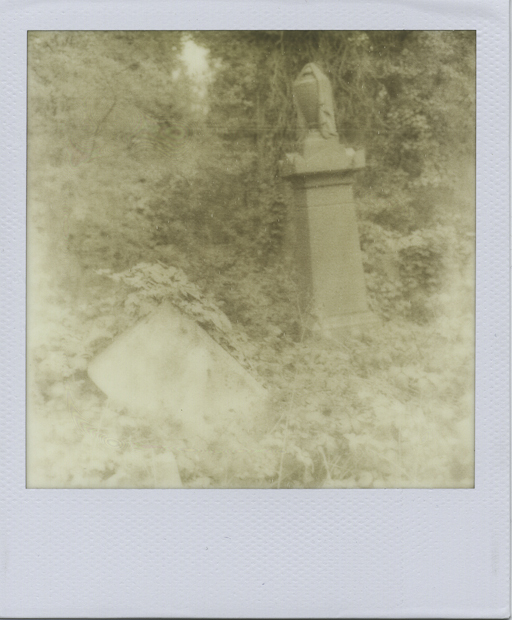 After scanning the Polaroids for my online album, some of the images have perked up a little. I’m guessing through the contrast being boosted during the scan, some auto-sharpening in the scanner and the higher dynamic range of the computer screen – and now one or two of them have become quite interesting images. Not quite what I intended – miles away from my usual style, but interesting, nonetheless, and appropriately Victorian-looking given the location. I’m not put-off with the new film either, I’m still expecting great things from the guys in Holland and I’ll be buying more film packs soon. In the meantime, I’ve still got about four or five packs of original film left and I’ll be playing with that in the near future. And if you’ve been using the new Polaroid film, please let me know through the comments.